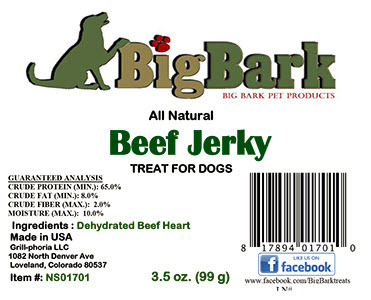 The recall includes approximately 200, 3.5 ounce bags of Big Bark All Natural Beef Jerky Treats for Dogs. The affected product was manufactured and distributed between September 20, 2014 through January 2, 2015. The packages do not have lot codes. Most people recover from salmonellosis in four to seven days without treatment. But some groups are at higher risk of developing more severe symptoms. These high-risk groups are: children under 5 years of age, the elderly, pregnant women, people with weakened immune systems. Consumers may contact Grill-Phoria between the hours of 9:00 am to 5:00 pm MT Monday through Friday at 970-663-4561.